Selective parathyroid venous catheterization is an invasive x-ray test performed by an invasive-radiologist. The goal of the test is to help find which part of your neck or chest is hiding the missing parathyroid tumor by determining which veins in your neck and chest has the highest levels of parathyroid hormone (PTH). The belief is that if one area of the neck, or one vein has a much higher PTH level than the others, it can be assumed that the missing parathyroid tumor is located in this area. The concept is that detection of a venous PTH gradient (one area with higher PTH levels) will allow for the doctors to tell which side of the body the parathyroid adenoma is located. Said differently, the goal is to be able to tell if the parathyroid tumor is on the right side of the body or the left, possibly telling if the tumor is in your chest or in your neck. Parathyroid Venous Sampling Doesn't Work and Should Never be Done. Parathyroid venous catheter is put into femoral vein in the groin and pushed up to the chest and into the neck Before we discuss why Parathyroid Venous Sampling doesn't work and why you should never allow your doctors to do this to you, let's discuss how the test is done. An "invasive radiologist" will be the doctor who performs this on you. It is very similar to undergoing a cardiac catheterization in that you are put on a table and your groin is prepped and made sterile. The radiologist will put a catheter (a long plastic tube) into the vein in your groin and then thread this catheter into your chest and up to your neck. 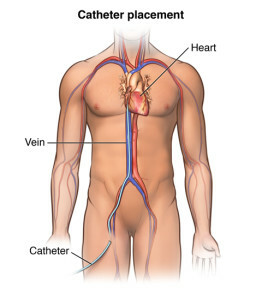 When undergoing cardiac catheterization they put the catheter tube into the artery in your groin and feed the tube up to your heart arteries. In this version, the long catheter tube is placed into the big femoral vein in your groin and the catheter stays in the vein system all the way up to your neck. As you can see in the photo, the radiologist is in a sterile environment to help prevent infection into your groin and blood. The radiologist takes x-rays of the catheter to watch it move up into your neck. He/she will inject contrast dye through the catheter tubing and take pictures of the dye so they can push the catheter into the different veins. Once the catheter is into the different veins, they hook up a syringe to the tube as it comes out of your groin and they draw blood from the vein in your neck (or chest) and they send this tube of blood to the lab to have the parathyroid hormone (PTH) level determined. During a typical parathyroid venous sampling the radiologist will draw about 20 big syringes of blood from you, from all the different veins in your neck and chest. Then 24 hours later or so, they will get 20 different PTH levels and the doctors will assign the different PTH levels to the different veins on a drawing of your neck (shown below). Parathyroid venous sampling being performed. 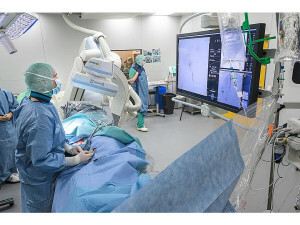 The photograph on the left shows the invasive radiologist manipulating the catheter in the patient's groin and watching it progress up the body into the neck. He can see the long catheter tube on the monitor as the x-ray machine takes a continuous scan of your body. He will inject dye every now and then to see the anatomy of the veins on the scan and manipulate the catheter into various veins. Once satisfied about the placement of the catheter, he will unhook his syringe of dye and hook up an empty syringe to draw blood out of that vein. The process is repeated 20 or 30 times. The procedure takes between 1 and 3 hours. Notice that the procedure is performed in a sterile room much like an operating room. Everybody is gowned and dressed just like an operating room. This is not just another x-ray test. This is a very serious and very expensive test. And it won't give any information that will help you. This risky test will waste your time and money. Parathyroid Venous Sampling Doesn't Work and Should Never be Done. HERE IS WHY. Venous sampling for parathyroid is unnecessary 100% of the time. The reasons below explain why this test is not helpful. 80% of the time there is no vein that can be identified with enough certainty that the result would influence a surgeon. In other words, all of the veins have about the same amount of parathyroid hormone in them. Thus, there isn't a vein that can be identified showing higher PTH levels than any other. When there is a vein identified that has a lot more PTH than the rest of them, the result is vague and once again, doesn't help the surgeon. In other words, it says the tumor is located on the left side of the body. Well that much help isn't any help at all. Or it will say, it is in the neck near the thyroid. Really? Isn't that were parathyroid glands are supposed to be located? This kind of information doesn't help. In the best case scenario, where there is one vein that has huge amounts of PTH compared to all the others, this test is still unnecessary because these tumors ALWAYS show up on sestamibi, 4-D CT scans or some other non-invasive measure. Said differently, if parathyroid venous sampling correctly shows the area of the body that houses the missing tumor, then a bunch of other tests would have already seen it. It is IMPOSSIBLE for a parathyroid venous catheterization to show a tumor that doesn't already show by some other method. I will say this again so you really get what I'm trying to say: it is impossible for parathyroid venous sampling to show where a tumor is located when we don't already know where it is with several other non-invasive test (like sestamibi or CT Scan). Be careful of publications or claims of this test being "correct" in identifying the parathyroid tumor. The claim for being "correct" is to say that the test showed a PTH gradient for a HUGE area of your body: right neck, left neck, or chest. That is of no use to a parathyroid surgeon. That is a huge area of the body and once again, even if this test shows an area where the tumor is located, the area is so huge (like the entire left side of your neck) that it doesn't help one little bit. Said differently, the proponents of parathyroid venous sampling say it can tell where the tumor is located sometimes, but what they are talking about is a huge area of the body that doesn't help the surgeon know where to cut. Information already known will provide more information than parathyroid venous sampling. By reading the surgeons operative report and by looking at the pathology report we will be able to see that the first surgeon found both parathyroid glands on the left side (for example) and thus the missing gland must be on the right. So if we know this already, what information can the venous sampling tell us that will help? Invasive radiologists are some of the best of all doctors. Their knowledge of anatomy is often remarkable and their knowledge of all sorts of different tumors is unparalleled. If you want to find some of the smartest doctors in any hospital, go find the invasive radiologists. However, remember that the radiologist is not the doctor that ordered the parathyroid selective venous sampling to be done on you, and if you ask them, almost all of them would not have this test done on themselves or their family members. I've asked dozens of these radiologists, and every one of them have said that they would not have this test because it rarely helps and when it does help the tumor was obvious on other non-invasive and non-dangerous tests. A few years back I was an invited speaker on parathyroid localization at the very large, national annual meeting of the American College of Radiology and from the podium I asked by a show of hands how many of these doctors would undergo parathyroid venous sampling on themselves and only a handful of hands went up in a room of hundreds of radiologists. I've never personally met an invasive radiologist who would have this test performed on themselves. What does that tell you? It tells you that they don't believe in the test and they know from experience that it isn't worth the risk. No good, actionable information will be gleaned. No helpful information will be obtained. If Parathyroid Venous Sampling is Worthless, Why do Doctors Order it? When doctors don't know what to do, they order tests. That is the sad truth. In every instance that this test is used, the doctor (typically a surgeon who can't find the parathyroid tumor) has already ordered a half-dozen scans. Before he/she sent you for Parathyroid Venous Sampling, they already sent you for two or three sestamibi scans, SPECT/CT, 4D-CT, ultrasound, and even MRI. If you have had all these tests and they don't know where the tumor is, then I can guarantee that the venous sampling will be negative. We perform nearly 70 parathyroid operations per week. Of those, about 5 or 6 are on people who have had failed parathyroid surgery at some other place before they came here. We do between 250 and 300 re-operations for failed parathyroid surgery per year. These people come to us with all sorts of different stories. About one in 30 of these patients have had parathyroid selective venous sampling. It never works. My entire career has been dedicated to parathyroid surgery and we have seen thousands of failed operations that have been sent to us, and probably a hundred parathyroid venous samplings and we have never, ever seen it help. We are fortunate to have amazing invasive radiologists at our large hospital who will be honest and tell you that this test won't help. We at the Norman Parathyroid Center perform more than 40 times the number of re-operations for failed parathyroid surgery, and we have never, not even once, ordered a parathyroid venous sampling. If your doctor ordered this test for you, simply decline. It means he/she is not an expert in parathyroid surgery and doesn't do this sort of thing very often. If your doctor ordered this test for you, then you know your doctor is grasping at straws and this is their last hope. They want to help you but don't know how-so they are ordering a test they know will be worthless but they just don't know what else to do. The answer is simple… politely refuse this stupid test and then find a more experienced doctor. Read more about re-operative parathyroid surgery. Read more about other types of scans used to find parathyroid tumors. Watch video of Dr Norman performing entire 4-gland parathyroid operation in less than 13 minutes. There is no blood, just lots of teaching. The drawing of the neck veins was taken from this article in JAMA.